It’s no longer grey – it’s black. What are we talking about? The balance spring! 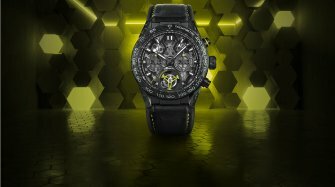 TAG Heuer has unveiled the very first carbon balance spring, inside a sculptural Carrera Calibre Heuer 02T Tourbillon Nanograph. Rumours have been flying around for some time, but the tectonic upheavals happening at the brand in recent months rather drew attention away from the work going on behind the scenes. But it’s all out in the open now. 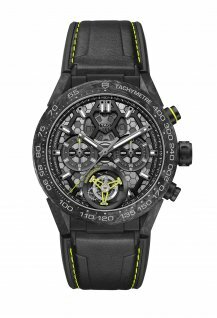 After Nivarox, whose balance springs inhabit over 95% of Swiss watches, and following the silicon version offered by Sigatec, it’s now the turn of the carbon balance spring, developed by the Institut TAG Heuer. The institute is the playground of Guy Sémon, the key figure behind TAG Heuer’s R&D efforts. He has survived the departure of Jean-Claude Biver, the arrival of his successor, Stéphane Bianchi, and the installation of a new designer fresh from Chopard and (briefly) Breitling, Guy Bove, to name just a few of the disruptions he has endured. Guy Sémon has continued to work tirelessly, reimagining the main elements of the mechanical movement such as the transmission and, now, the escapement. 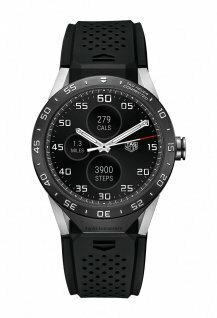 Although these components have already seen several developments (Mikropendulum, Mikrogirder), this is the first time that TAG Heuer’s R&D department has turned its attention to a traditional system -- the tourbillon -- with a view to make drastic improvements to one of its parts, the balance spring. What’s so good about carbon? But first, let’s get some of the main objections out of the way. What makes carbon better than silicon? After all, silicon already ticks many of the boxes for a watchmaker’s ideal material: it’s flexible, strong, anti-magnetic and resistant to temperature variations. What makes carbon any better? 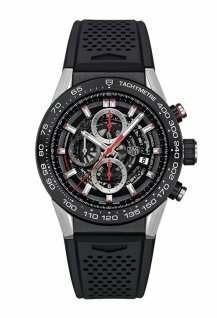 Only long-term experience will tell, but TAG Heuer is already touting several additional advantages. First, thanks to the extremely light weight of carbon – it’s even lighter than silicon – it is resistant to gravity. 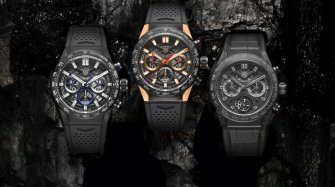 By definition, it can’t be completely immune (the Earth’s gravity affects everything without exception), but TAG Heuer claims that its effects are close to zero. 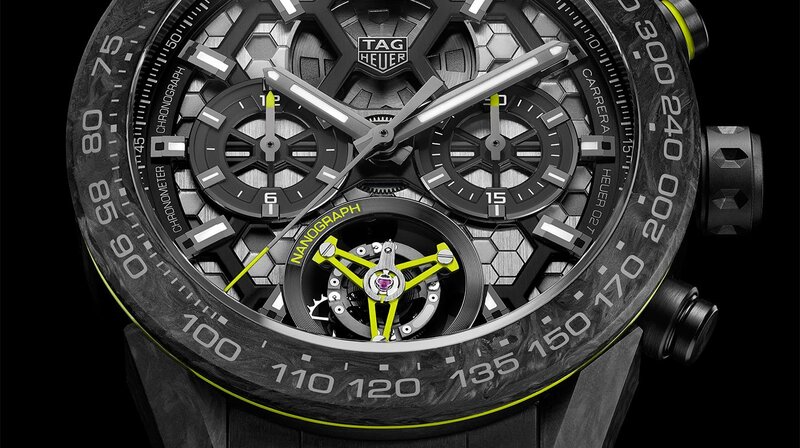 In addition, TAG Heuer notes that its oscillations are perfectly concentric. That’s because carbon has a highly regular structure. These advantages add up to greater precision (the watch is certified by the COSC), although the watchmaker has not (yet) put a figure on the gain. Aesthetically, the Carrera Calibre Heuer 02T Tourbillon Nanograph is based on the nanoscopic (= one million times smaller than a millimetre) hexagonal structure of the carbon composite material used to make the balance spring. The case is made of titanium, with a carbon bezel. A carbon case would also have been welcome, although it would inevitably have been more expensive. Nevertheless, it could have been reserved for a subset of wealthy collectors and “full carbon” geeks, perhaps as a limited series. Overall, the watch has a “honeycomb” aesthetic (or perhaps “football”, depending on your point of view), with black as the dominant colour, smartly accented with a vibrant yellow-green. It’s very easy to read. Eventually, we might look forward to seeing a complete chromatic inversion, with a watch in bright colours, or even a transparent case, to showcase the black balance spring even better. 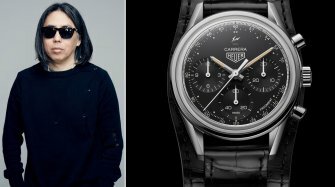 Nevertheless, the idea of this innovation being rolled out to the group’s more classic brands – Zenith, for instance – could present some aesthetic objections with the more conservative collectors who are used to the metallic glint of a traditional hairspring. 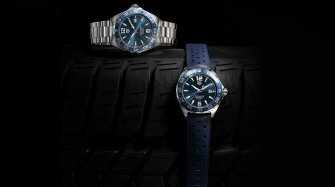 The watch will be available in April at a price of €23,200. There are no indications yet whether the series will be limited or part of a collection, but it will in any case not be numbered.